My antipathy for Ross Andrew’s work primarily stemmed from the fact that his Flash wasn’t my Flash. Andrew eschewed the leith Infantino look and opted for the more bulked-up style. The poses, backgrounds and expressions were all just a little bit off. Even in hindsight, while the work is solid, I still find myself missing the Infantino touch. 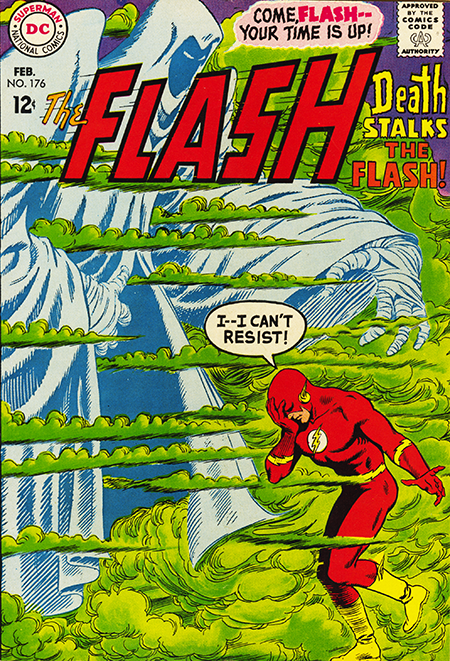 That being said, the John Broome story about the Flash battling Death in Death’s dimension to save an ailing Iris was quite good and a departure from the usual story telling not seen since his Doorway to the Unknown piece. The second story was another little pocket story involving Iris’s father Professor West and a gang trying to turn his great intellect to evil intent. Broome was in a more comfortable setting here, but the art change remained a jarring element. Unfortunately, things would get worse before they got better.